Wow! Sometimes simplicity rules the day. I really like this video showing you how easy it is to turn an ordinary orchid plant into a stunning work of art. If you seriously looking to add simple, yet innovative ideas to your floral design arsenal, or maybe just looking to create an exciting design for your own home, this video is for you. It walks you through how to take a phalaenopsis orchid plant and dress it up with a modern, upscale look. It’s a video I think you’re going to really get something out of, especially if you are a die-hard orchid plant enthusiast. Watch and see if you feel the same. Well, did you like the video? I truly hope so! The beauty of this technique is that it can be easily replicated with all types of orchid plants and other seasonal design materials. 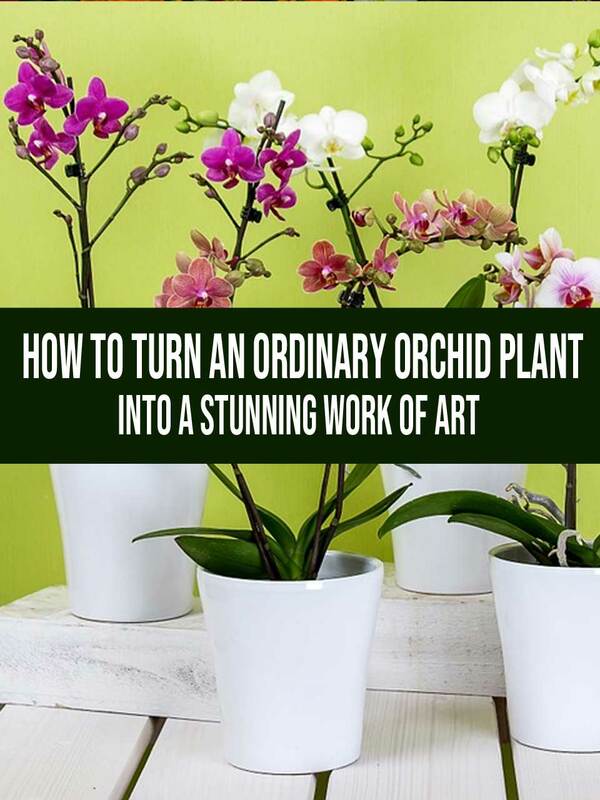 Just think how easily you can create gorgeous orchid plant designs like this, by following the basic steps outlined in the video. When you think about it, the possibilities are only limited by your imagination. And while we’re on the topic, the materials used in this video, including the Monaco vase, wire and water cubes can readily be purchased online. Use can use any type of stakes to support the orchid plant. I’ve used painted PVC pipe, river cane, copper tubes and galvanized plumbing pipe. whatever looked best with the container I was using. You can find top quality orchid plants nearly everywhere these days, from big box stores to local flower shops, so just find one you like and you’ll be good to go. If you want to use a silk orchid plant, you can find an outstanding selection online at NearlyNatural, or at craft sites such as Hobby Lobby and Michaels, or by ordering them through your local florist. So look, before we even begin, an admission is in order. The main reason this site exists is a selfish one. You see, I watch a lot of floral design videos (like the orchid plant presentation you just enjoyed), and I honestly just wanted a place where I could re-watch and share all of my favorites under one roof. I also know a good opportunity when I see one. Why lie? As you can likely tell, I’m not one to pull punches. But (and this is a big but)… any possible monetary benefit is incidental, and I’m not here to sell you anything. And that’s the purpose that FlowersFloralFlorist serves. It’s pretty much a place for like-minded people to come together and watch videos about innovative floral design ideas. So please keep comin’ back! I’ll keep sharing loads of high-quality videos that cover plants, weddings, and flowers… along with any other things I think may interest you! And as always, your input and feedback mean a lot to me. So tell me what you thought of the orchid plant video in the comments section below.